DOT is set to move forward with a protected bike lane on Sixth Avenue from 8th Street to 33rd Street after members of the Community Board 4 transportation committee gave the project a thumbs-up last night. In November, the committee declined to support the proposal because members felt the new design did not do enough to protect pedestrians and cyclists. Of particular concern was the lack of raised concrete pedestrian islands and split-phase signals, which give cyclists and pedestrians dedicated time to cross streets without conflicts with turning traffic. Since then, CB 2 and CB 5 committees both endorsed the plan. Last night, committee members reiterated many of their concerns but ultimately voted to endorse the plan. DOT has adjusted the project in a few ways since November, including the addition of 33 raised concrete pedestrian islands. But DOT did not add split-phase signals to the plan, which currently includes them at the intersections with 14th Street and 23rd Street. This did not sit well with CB 4 Chair Christine Berthet, who challenged DOT’s Ted Wright and Preston Johnson on the safety of mixing zones, in which cyclists merge with turning traffic at intersections. Wright and Johnson said they would be open to studying additional split-phase intersections in the future. The committee’s resolution in support of the proposal calls on DOT to install two more split-phase signals within the year. Is there any data on the safety of mixing zones as DOT currently designs them? Personally I find them a terrifying element of otherwise very safe-feeling commutes and put them on par with faded sharrows. My guess is others don’t enjoy them either. That said, hard data on their effectiveness would be helpful. Have they even considered extending the green paint through the mixing zone or across the side streets? Has anyone ever presented a figure on the marginal cost increase of green pigmented asphalt when streets with protected lanes are repaved? Should we be repainting these over and over in perpetuity? Years go by and design is getting worse when it should be getting better. They are my least favorite part of any protected bike lane in NYC. However, I’ve learned to check over my right shoulder and move out to the right edge of the mixing zone ASAP every other block as a matter of course. As long as no one is parked in the “buffer” area I don’t usually even need to slow down. That being said, a protected bike lane shouldn’t require a strategy and a confident rider to make them work right. The biggest increase in safety is on the part of 9th Ave with split phase. One interesting bit is that you can see a difference (though maybe not a huge one) between different width portions of the 2nd Ave lane. Wider is safer (though other factors may be involved such as traffic volumes). 8th Avenue is unsurprisingly terrible. Peak hourly motor traffic on sixth is a measly 1,800 vehicles at 23rd. this is easily handled by 3 lanes. 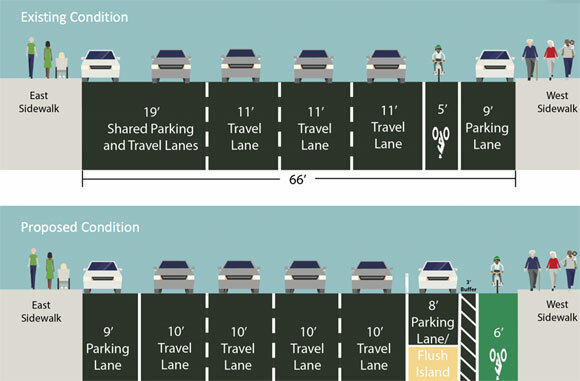 After the “protected” lane is installed, Sixth will be as unrideable as Eighth: http://www.huffingtonpost.com/cody-lyon/the-chaos-on-the-eighth-a_b_9012382.html. It’s all right if you’re cycling at walking pace, but forget about trying to use it if you’re in a hurry. I worry about this too, but aren’t the sidewalks wider on 6th Ave? Perhaps people walking won’t need to use the bike lanes, unlike 8th Ave where the sidewalks are jammed. But for 8th Ave and others where bike lanes are being blocked by pedestrians, perhaps we need a center-running, Jersey barrier protected 2-way lane? Not sure how this would work making turns, but it would certainly be interesting to see. Sort of like DC’s Pennsylvania Avenue. And apologies for using the word “perhaps” twice. MassDOT’s new guide to separated bike lanes classifies mixing zones as creating “medium to high level of exposure”. This is in stark contrast to protected intersections, which create a “low level of exposure”. Also, the Netherlands, the safest place to ride a bicycle on earth, doesn’t use mixing zones anymore for the very same reason. Sadly, Wright and Johnson and a whole host of folks at DOT don’t appear to be paying attention to best practices from anywhere outside of NYC, which is really disheartening. Under JSK, NYCDOT was a leader in the field, pushing the bounds of innovation. No longer it seems. Eighth Avenue is completely rideable south of 33rd St. That article is specifically talking about 34th to 50th St, which is a whole different ballgame. Huge difference between the two sections. DOT published an analysis of bike lanes safety in September 2014 showing the clear superiority of turn lanes (50% crash reduction) versus mixing zones( 30% or less) , because of split phase signals versus normal signals . http://www.nyc.gov/html/dot/downloads/pdf/2014-11-bicycle-path-data-analysis.pdf. Another study was just published to the same effect. DOT denied the validity of any data that is in conflict with their creed. Feels like FOXnews to me . And this was the same day as diblasio announcement of 2016 special emphasis on left turns. I am glad our advovacy got us 33 refuges, but it’s clear the DOT engineers did not get the VISION ZERO memo or need to be seriously rewired. Nothing, nada, meanwhile last month MTA is planning to split the M5 routes because of delays. We asked them what about working with DOT to create a bus lane on 6 th, which is the real problem…. And then the mixing zones are killing you since the turning queues are so long and so packed you practically have to ride half the block in traffic…. Christine Berhet is no longer Chair of CB4 ( term limits) . Just Chair of Transportation.